The main object of interest is (again) the total Solar eclipse which will happen across Africa this year. To see it we have gathered up to go to Kenya. But the eclipse is only one of the aims. We also plan to see some of those African animals from zoo in wild now. We are 8 people again, yet there are some new faces in our group. Read about us in the About page and about our previous trips here: 2008 – 2009 – 2012. Total Solar eclipses happen around once every 1.5 years. However, this time the eclipse is a very special one – it’s called a Hybrid eclipse which means that in some places along the path it is seen as a Total and in others as an Annular one. We are going to see it near lake Turkana, one of the largest saltwater lakes of the world, and at that spot it will be a Total one. It will be visible on the afternoon of 3rd of November. The total phase for this eclipse is a short one. The maximum length of the total phase falls in the Atlantic ocean. It hits the coast of Africa in Gabon, continues through Congo, DR Congo, Uganda, Kenya, Ethiopia while getting shorter and shorter, and finishes in Somalia. To the left there is a map of the eclipse visibility. The light blue circle marks partial eclipse. The tiny black dot in the centre marks total eclipse. The time in the animation is UTC. One would have thought that it would make more sense to go to Gabon to be able to experience longer totality. However, Gabon is not the sunniest place during this season. There’s certainly more fun to see the Sun during the eclipse than only to see a clouds getting darker and darker before the night comes for a short moment. The west side of Kenya should be the sunniest region on land at that moment along the eclipse path, so we are going there. As much as the calls of adventure would push the road trip by a car from Europe, it won’t happen unfortunately. This time at least. That’s because of the too agitated situation in the Northern Africa for last few years. Therefore we are going by plane and are scheduled to arrive there on the evening of 28th of October. Anders and Rudolfs have decided to spend some more time climbing the mountains of Kenya, so they are going two weeks earlier. We will spend a day in Nairobi before heading out to Maasai Mara animal reserve, continuing to Kisumu on the coast of the huge Lake Victoria and then up north via Lodwar to Lake Turkana. After the eclipse we will return to Nairobi past the huge Mount Kenya and continue to another animal park – Amboseli where we hope to get the photo shots of elephants on the Kilimanjaro background. On to Mombasa for some chilling out day and the back to Nairobi to catch our flight home. 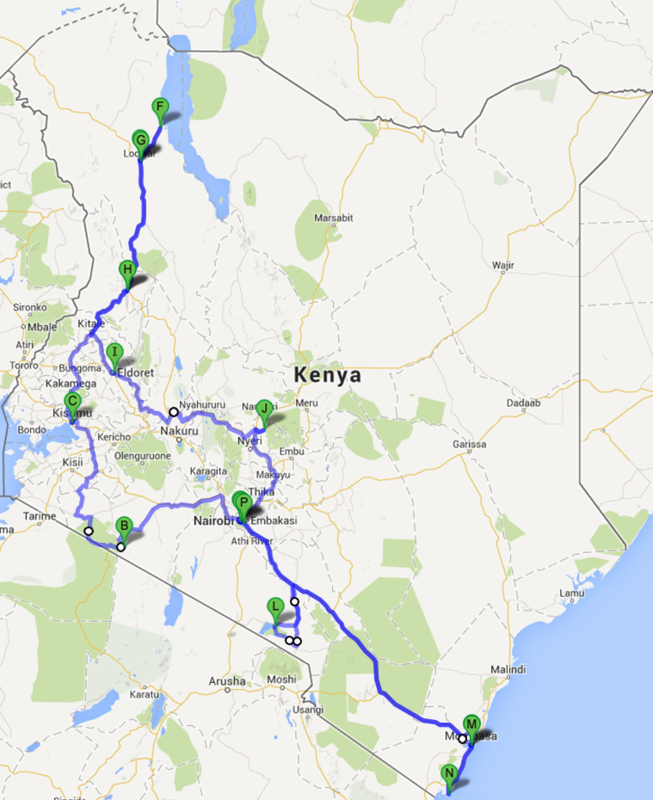 The route in the map below is not final – it’s possible that we will go from Maasai Mara to Kisumu along some smoother road and also there might be changes in the route between Lodwar and Nairobi. Click on the image to get an interactive Google map. In addition there will be another google map available on the right side dashboard that will get updated daily and will include all twitter updates placeholders.